The stories collected in the deluxe Legion of Super-Heroes: The Curse are not what you would traditionally find within a deluxe book. I enjoy the oversized format, but there's a lack of event status here that usually underlies collecting a book in this way. That the story for which this book is named appears only at the very end of the volume, and has little to do with the rest of the book, further reinforces what a strange and arbitrary choice it was to produce this collection at all. Yet still, I enjoyed it thoroughly, and I'd entirely purchase another volume if DC Comics saw fit to continue this collection series. The Curse is a fair sequel to DC's previous deluxe Legion book, The Great Darkness Saga, in that Curse cleans up a number of Darkness's dangling plotlines: the redemption of Chameleon Boy, for one; the fruition of Darkseid's curse; and the revelation of an impostor in the Legion's midst. This latter item makes clearer a bunch of strange scenes in Darkness, so in this way Curse is a good buy for Darkness fans. Curse would be a poor collection to read on its own, however; most of what concludes in Curse begins in Darkness, and whereas Darkness has an element of self-containment, most of Curse's narrative power comes in finishing stories begun in the first volume. Curse is a study in anti-climaxes. Writer Paul Levitz starts off the book strongly with an issue about Cosmic Boy lashing out in anger over a terrorist attack on his parents, but then we hardly see "Cos" again for the rest of the book. The stories in which Element Lad and Shvaughn Erin seek the Legion impostor are some of the book's best -- but when the impostor is revealed, there's very little follow-up about the shape-shifting Durlan Yera nor about the kidnapped Shinking Violet. There's a couple of anniversary issues and annuals here that, in the tradition of such, are mostly self-contained. The main part of the book (before the concluding "Curse" Annual #3) ends with a not-terribly-exciting story of the Legion and Science Police stopping a run-of-the-mill blackmailer without too much trouble. The book is somewhat "sleepy" -- there's a number of interesting issues focusing on various Legionnaires, but nothing to get your heart pumping like Great Darkness -- but this is to an extent why I like it. Far from today's creators' habit of writing operatic six-issue stories for every collection, Curse is a collection of a series, just as that series was when it was published. To track down these Legion issues on their own would be difficult and expensive, and they're not available digitally yet, so if someone wants to "just read some good Legion issues, Curse presents a fine way to do it. This is akin to what DC does with the Archives, Showcase Presents, and Chronicles books, though the deluxe format and jacket styling gives the two new Legion books some extra "oomph" for me that the more sedate Archives, for instance, don't have. Like the early chapters of Darkness, the villains that the Legion face in Curse are routinely forgettable, letting the book instead focus on the characters. The most compelling stories are those like, again, Chameleon Boy's struggle to regain his powers alongside his estranged father R. J. Brande, and Dawnstar's "walkabout" that ends with reaffirming her love for Wildfire. Colossal Boy's relationship with Yera-as-Violet doesn't get enough screen-time to be convincing, but Levitz's story of Gim introducing his new controversial wife to his mother -- who also happens to be the United Planets president -- is a humorous instant classic. It's here where Curse succeeds (and the same is probably true for most modern Legion of Super-Heroes); not in heroes versus villains, but in using this far-flung futuristic setting to examine human situations in a way that other traditional superhero comics probably cannot. The most significant part of the four-issue "Omen" story in this book (as much of a climax as the volume has outside "Curse") is not the poorly-defined villain, but the Khunds complicated insistence on refusing Legion help even though they need it. The diplomatic dealings here and issues of cultural pride far outshine Levitz's too-long action epic (though it gives artist Keith Giffen his best chance to shine in these volumes since the end of "Great Darkness"). Curse ends right at the point where the Legion of Super-Heroes title split to Tales of the Legion (which preserved the original title's numbering) and a new Legion of Super-Heroes title with fresh numbering. The first thirteen issues of the latter are collected in two paperbacks, which I'd be inclined to purchase except they don't include the related Tales issues, and I hold out hope that DC will collect these, too, in a deluxe edition. The fact that the issues are already collected makes this doubtful, but given that the deluxe Great Darkness was successful enough to warrant Curse, fingers crossed that Curse will itself give way to more. 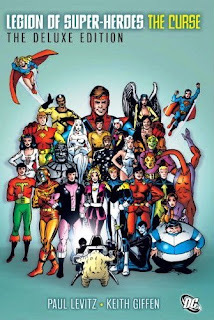 Legion of Super-Heroes: The Curse is a prime example of what we've lost in the write-for-the-trade culture (even acknowledging that the book itself is a high-end trade, and that yours truly has been more a part of the problem than the solution). It's a collection that whips and weaves through a variety of stories and ultimately achieves not a whole lot, but it's enjoyable -- and an interesting slice of mostly in-continuity, pre-Crisis on Infinite Earths Legion history. Most new collections these days (and the stories within) are striving for something, whereas the Curse collection strives for nothing and yet still succeeds as a good book, especially alongside Great Darkness. Be not discouraged, DC -- if you release another one, I'll buy it. Next week, we bring the Legion into the modern era with reviews of Legion: Consequences and DC Comics Presents. See you then! Has their been any indication if these collections will be reprinted in softcover? I haven't heard mention of such. I imagine the paperbacks, if released, would not be deluxe size; personally I'm still hoping for more of these Legion hardcovers. love this era! I hope for more! I really liked this volume, so I hope we see more. I hadn't experienced the Legion before these, but they were awesome. Yeah, I would also love to get these, but preferably in paperback form.. Didn't DC publish some huge omnibus-sized collections? I remember some Hawkman TPB featuring that many pages/issues..